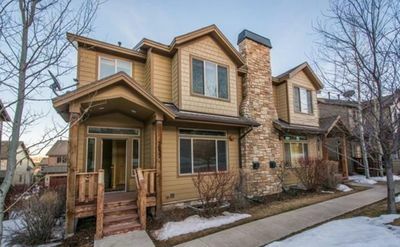 Welcome to our beautiful Park City Canyons Village Condo Page. 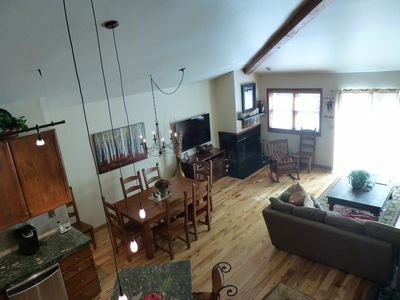 This rental is a 2BR ‘Signature Villa' in the desirable Elk Lodge (closest resort to village/lifts/amenities see map in photos). 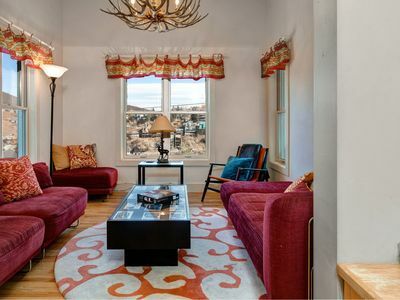 This is in the updated Elk Lodge which was last refreshed in 2013 with new appliances, furniture, and fixtures. Beware the lower quality 'Luxury Suite' rentals in the Moose and Bison Lodges, which are several elevator rides and long hallways away from the all resort amenities including the ski and boot locker room, indoor/outdoor pool & hottubs, game room and the Canyons Village Center which is directly outside the Elk Lodge (feel free to contact us for more info and see village map in photos). This is a luxury condo with all the amenities. 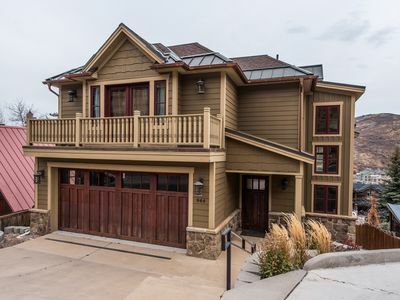 Ski valet, locker room, 30,000 Square foot Spa, casual and formal dining at Drafts Burger Bar and Edge Steakhouse (everything from ribeye to A5 Wagyu). 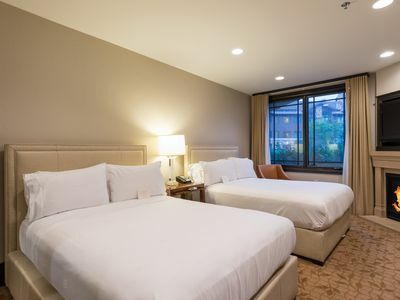 COMPLIMENTARY ON-DEMAND SHUTTLE INCLUDED service Main Street, Deer Valley, grocery stores and local food and entertainment venues, take an uber from the airport (30 minutes) and no rental car is necessary for your vacation. 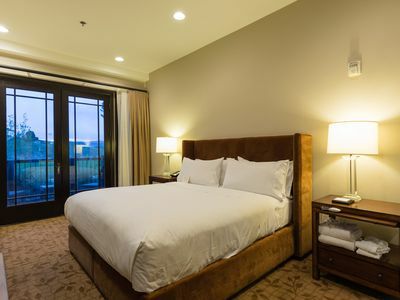 Master bedroom has its own jetted tub and steam shower. Second bedroom with en-suite has a separate kitchen, which makes it perfect for kids or teens or even a second family. 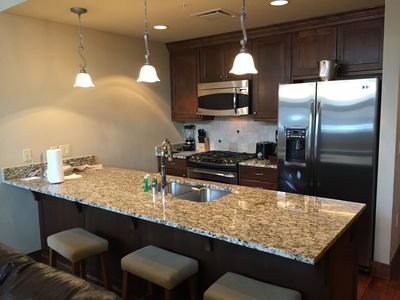 Kitchens are fully furnished: refrigerator, stove, microwave, utensils and linens. 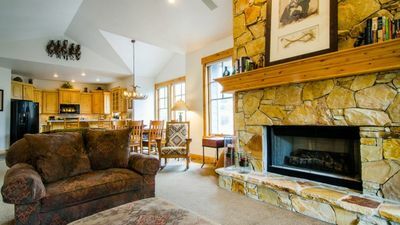 Drop your bags, brew some hot chocolate, and sit by the fire looking out at the mountains - Park City Canyons Village is about 30 minutes from Salt Lake City airport! If you take a morning flight you can ski all afternoon on the day of arrival (we do!). In the morning, the skier services concierge will take your skis/boards from the skier storage room to the gondola; you have only a short walk (30 seconds) from the resort to the gondola, and your skis/boards will be there waiting for you. You then drop them off at the end of the day with the attendant after downloading the gondola or skiing to the base village and they are stored for the evening. The ski valet stores your skis overnight, and even dry your boots and gloves and place them back in your personal locker. 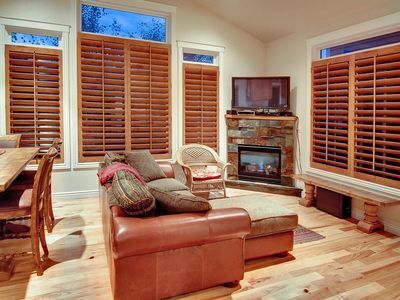 No wet boots, skis, or poles to take up space in the condo! 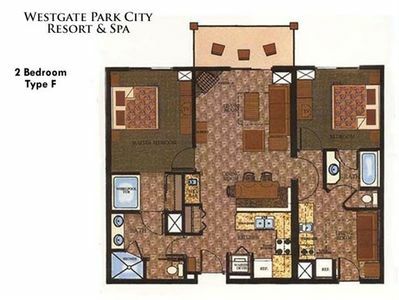 The Westgate Resort and Spa is located at the Canyons Village at Park City Resort. 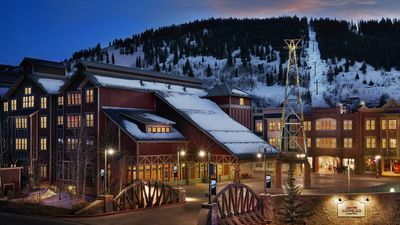 Vail Resorts has linked two of North America’s greatest ski areas (Park City and Canyons Resort)– creating the largest resort in the United States with 7,300 acres of skiable terrain. 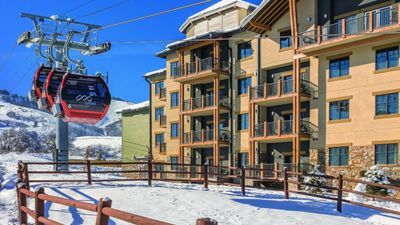 Park City Mountain now includes both the existing ‘Park City Mountain Resort’ and the much larger ‘Canyons Resort’, and a new interconnect gondola links the two areas, creating the US's largest ski area. While the new resort is called Park City, the majority of the new ski area is comprised of the Canyons 4500+ Acres of skiable terrain. 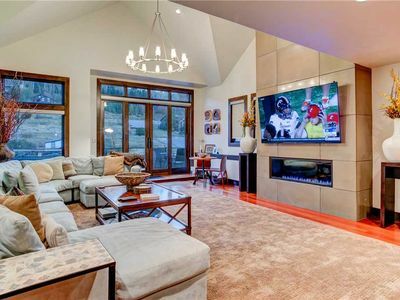 The Canyons Village is the perfect launch point for the larger, more varied, and more popular side of the new resort, and is by far the most varied, expansive, and scenic terrain of the park city ski areas. 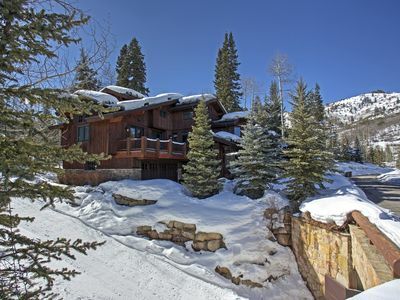 For real skiers the Canyons Village is a much more desirable location than the Park City Base area. To get to the Canyons side of the new resort from the PC base area or town will take well over 1 hour and involves the very crowded lifts on the Park City Side. 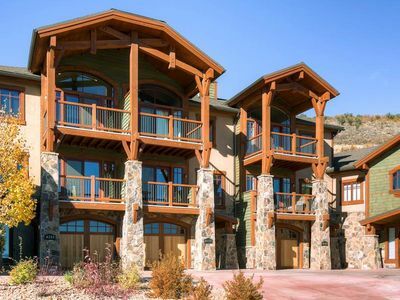 If you plan on skiing primarily at the Canyons side we highly recommend staying at Canyons Village. 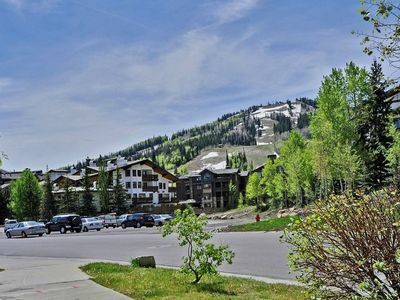 The Canyons Village amenities include the open-air forum where you can find apres-ski and concerts, a variety of award-winning restaurants, ski and board rental, ticket sales, ski school, ski/board and clothing retail, small grocery and day-care. 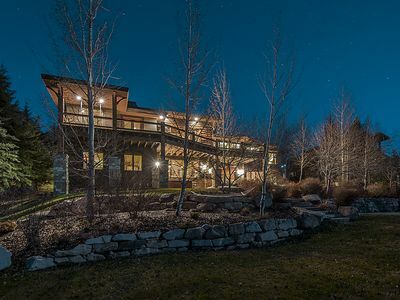 Luxury 5 bedroom on Deer Valley Dr! All the bells and whistles. Great location!! Feel the rush when you hit the slopes! 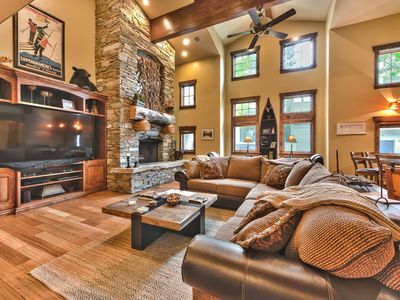 Enjoy The Slopes At Park City! 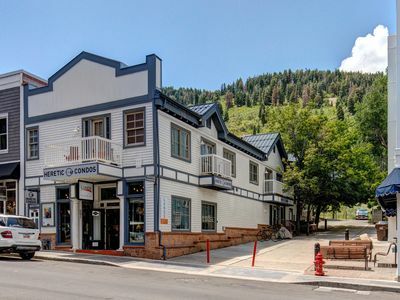 Marriott Summit Watch Studio (Sleeps 4) During Sundance on Main St.